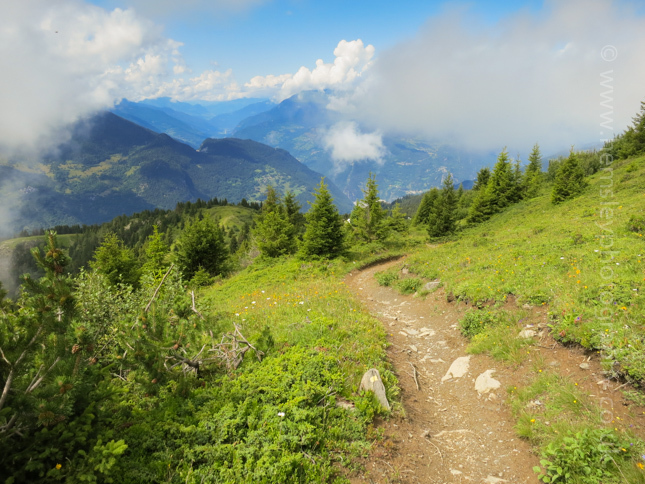 A couple of weeks ago I posted an article direct from Méribel whilst on summer holiday, click here for the link. It was about how gorgeous the mountain views are especially at sunrise time. But getting up at 03.30am a couple of times isn't everybody's idea of a fun thing to do on holiday. 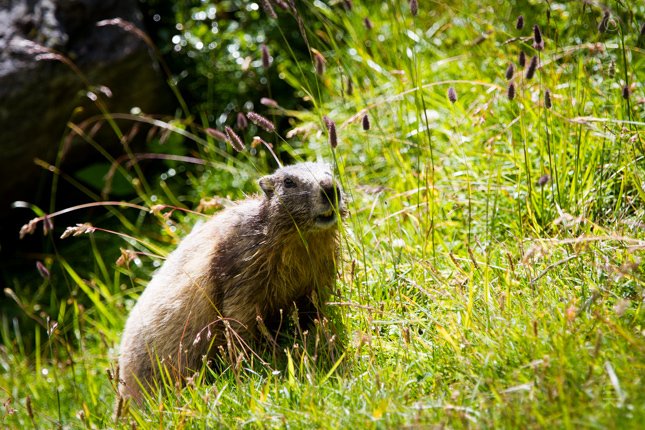 So was there much else going on in Meribel to help occupy visitors in the summer? Not half. As soon as my wife Harriet arrived for her shorter version of a summer trip, it was time to check out some of her favourite activities. The day before her arrival, I couldn't help but notice there was 'evidence' of horses up and down what is the 'truite' green piste in winter which runs between Mottaret and Chaudanne. When I say 'evidence', it was the sort of stuff I didn't want to cycle through, let's just leave it like that. Sure enough, on Harriet's first day she was able to book herself onto a two hour randonnée. These creatures are not any old Dobbins either, they are beautiful horses. 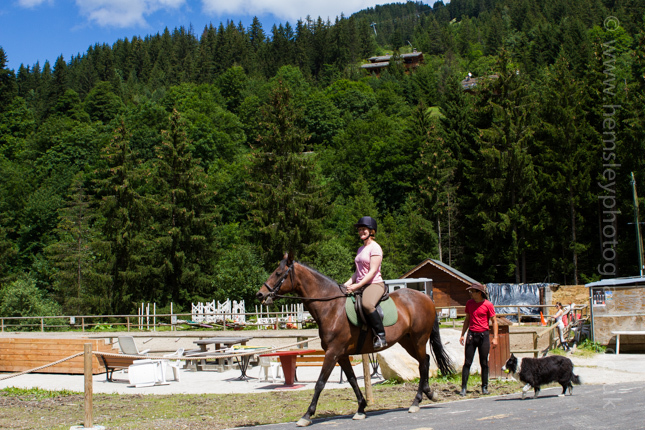 If you are familiar with skiing down the Truite piste, the stables are located on the right just over half way down, the opposite side to the tennis courts. Granted the stables will be covered in snow in winter, but if you look closely you will be able to make them out. Have a look next time you ski down there. I recognised another member on the hack, a colleague of mine from the ESF. He is the rider in front of Harriet (pictured in the light pink t-shirt). His name is Mick. And he was riding a horse called ........ Mick! 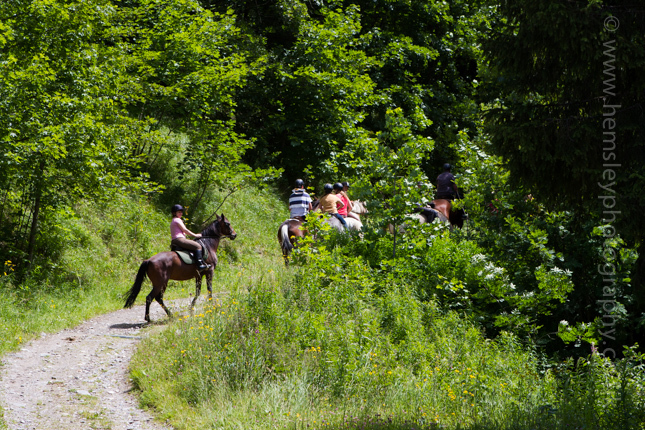 It is a very friendly and welcoming stables, and provides several types of lessons within the menage, and leads several randonnée routes of varying distances. 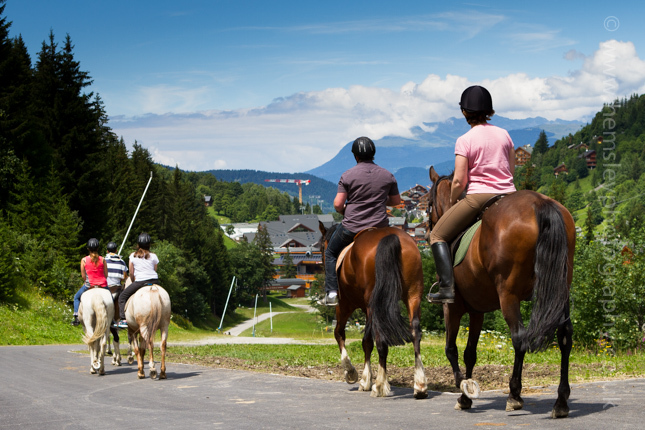 So does Méribel offer keen horse riders much in summer? Not half. So what else is there to do, how about going for a walk? The choice of routes is massive. 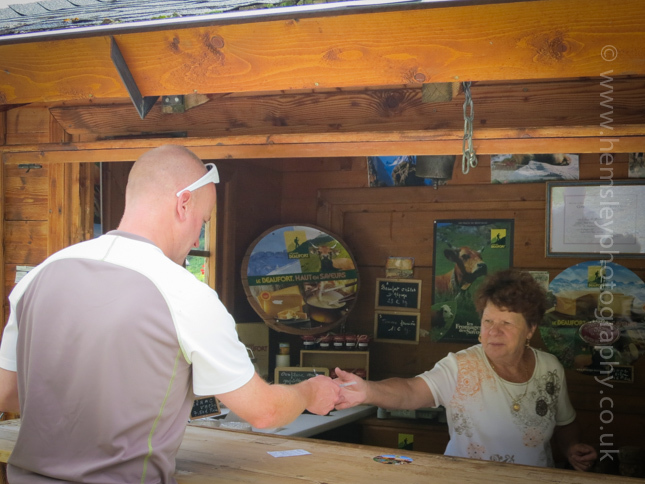 You can go to the Tourist Office and pick up a leaflet or two for suggestions, or book a local guide. Another option is go exploring with an IGN map (the French equivalent of OS maps). 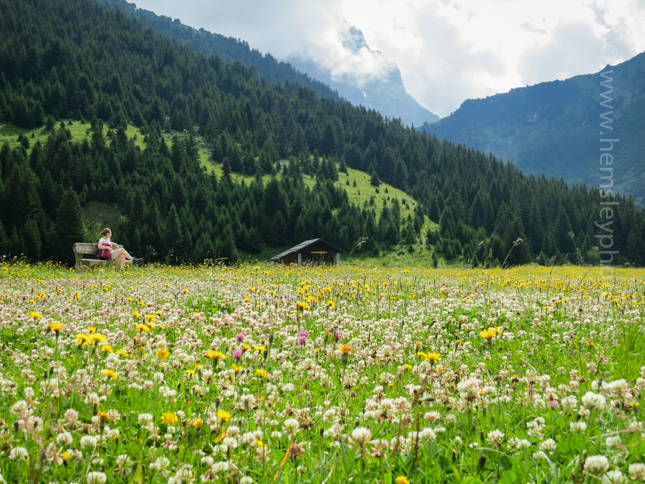 If you have never seen the Alps in the summer, it is a truly beautiful place, and what better way than to go for a walk to experience this. One day we ventured into the National Park for a stroll. 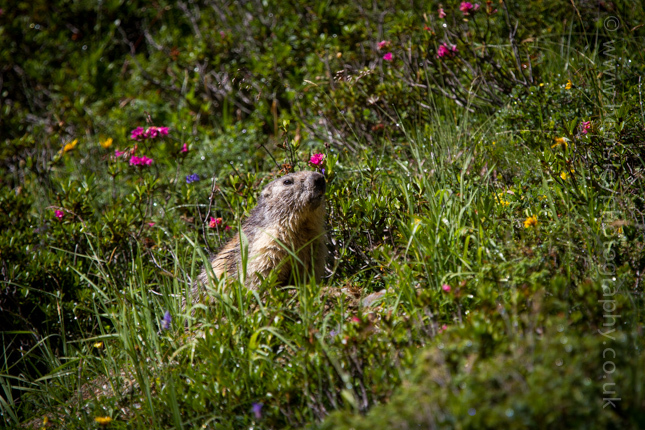 The Alpine flowers were in full bloom. What with the cocktail of fresh mountain air, and comfortable temperatures and sunshine, it was a real treat. 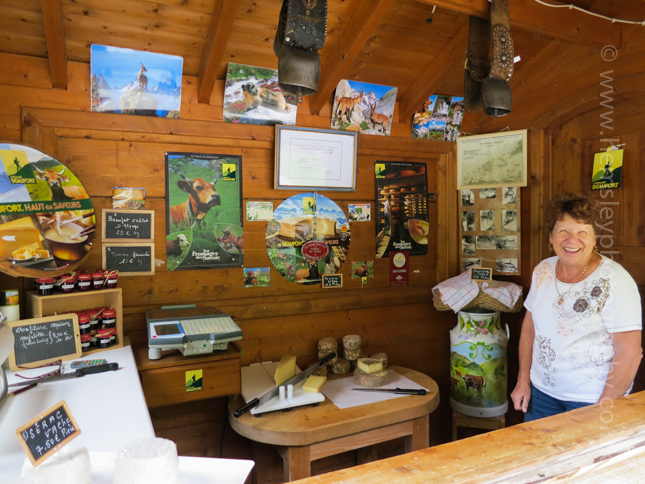 We even found a 'farm shop' run by a very friendly lady. If you are familiar with the 'Ours' piste between the bottom of Mont Vallon and Mottaret, you may sometimes look down into the Lac du Tueda area. In the summer, there is a small Alpine farm nestled close to the Lac. Various different animals were being tended including pigs, hens and cows. The choice of cheese was very interesting. We opted for a summer Beaufort, and a chunk of Tomme de Savoie. Later back in the apartment we performed a blind taste test with the same cheese bought in a supermarket. Wow, what a difference. Bet you can't guess which cheese was the tastiest? 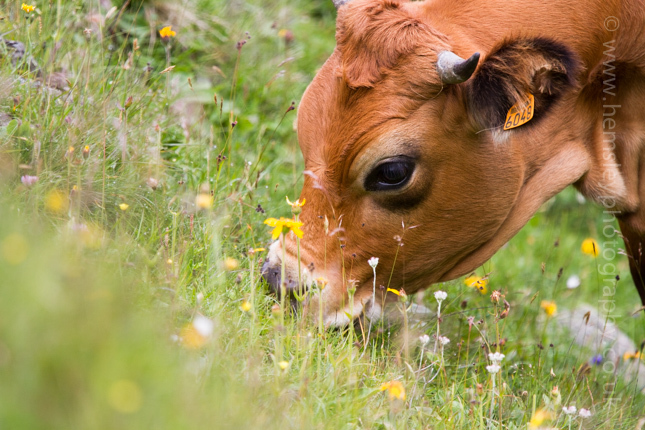 Even some of the cows had their huge noisy cow bells around their necks. At first I wondered if this was for the benefit of the tourists. However on reflection, I suspect attaching the bells is a very useful method for locating the odd stray cow that decides to go for its own version of a walk. Some of the well behaved cows were spared the constant ringing. 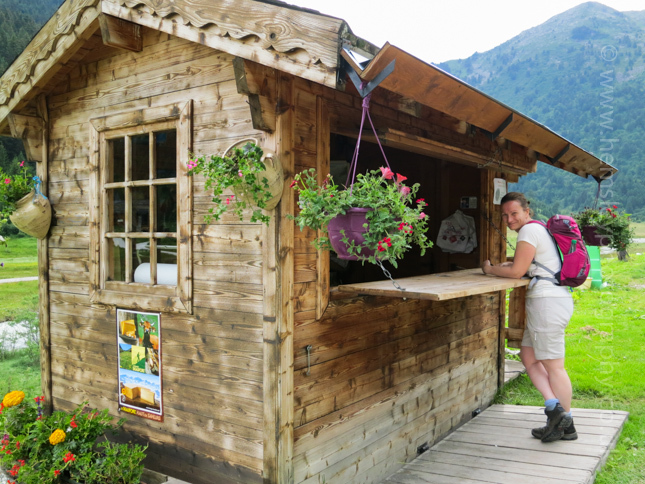 With several mountain refuges close by, a network of hundreds of miles of walking paths, and over two thousand vertical metres of alitude available, do you think Méribel offers the walker much? Not half. Next up, mountain biking. Oh my goodness. This sport is at such a diffierent level compared to what most of the UK can offer. Scotland is very well set up especially up in the highlands. 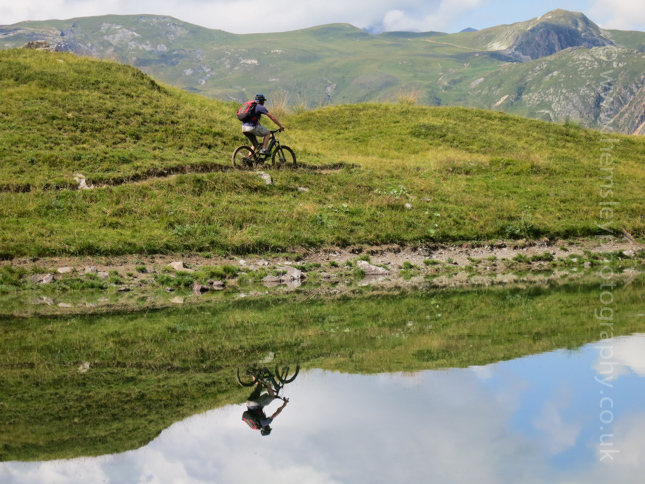 But the Alps, ladies and gentlemen, the Alps are just mind blowing for mountain bikers. For six days a week there are some of the ski lifts that run to ease the pain of going uphill, with a couple of days a week links over into the other two of the three valleys. The views are just as immense of course, but unlike walking, you have to concentrate on what is coming at you really rather fast. Any loss of concentration can end in tears. One day I was able to meet up with friend and fellow ski instructor Gary Bruce for a ride. It was great fun catching up in what is a very different environment in the summer compared to the busy winter months when we are both working. We of course had a right old gossip about skiing and all sorts of things. But most importantly we just enjoyed being out in the fresh air and shared our love of cycling. It was interesting to talk about where we were on the mountain. 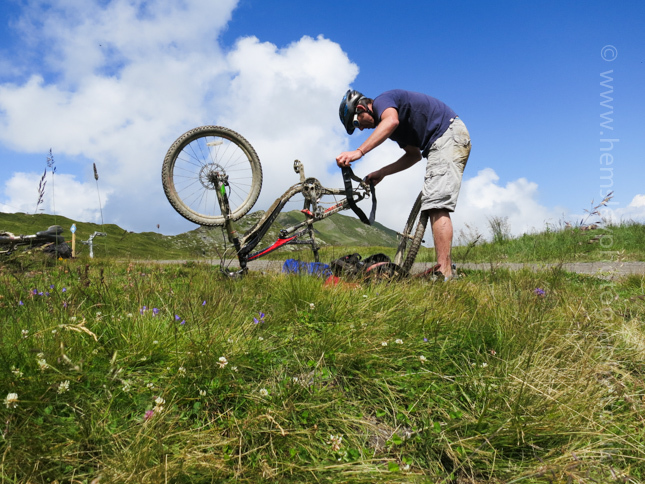 Many of the bike tracks are areas off-piste in the winter, so getting your bearings and deciding on our location was good fun. One area of excellent single track that comprised of countless berms (banked turns), darted off and on the blue 'choucas' piste. At the bottom of this track we were both buzzing from the ride, and I said "Quite how neither of us have punctured down there because of the scree and rocks I do not know." Gary replied "Don't say that out aloud", and rode off to the sound of pssssssssss. He had punctured, and gave me a filthy look! Didn't take long to fix though, but then moments after we moved off from that spot, I had a rear brake failure. End of the day. Oh well. 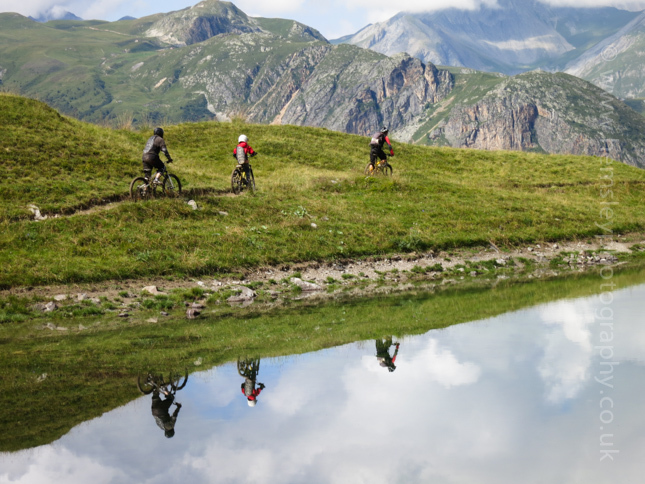 Meribel in fact hosts at the end of August the end of season UCI World Cup Downhill and Cross Country Finals. 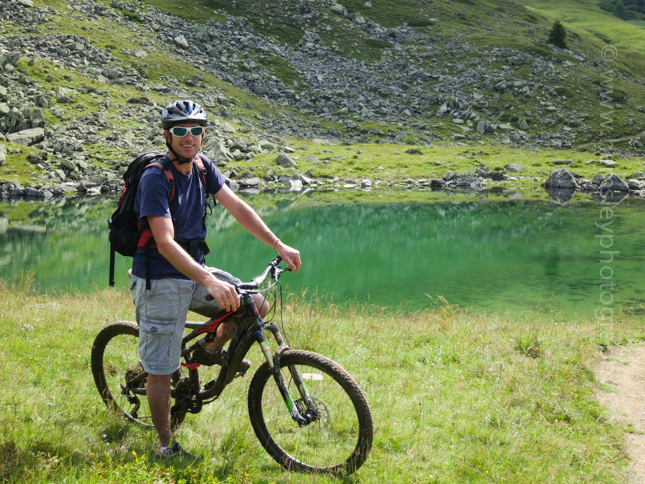 So is Méribel a popular destination for bikers? A brake burning, tyre shredding, fore arm pumping NOT HALF. Gosh, that got a little alpha male and macho. Time to calm down a bit and think about something else. Wildlife. 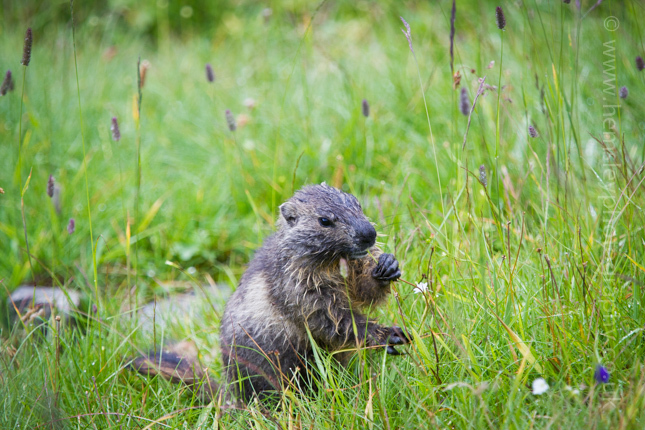 How many times have you been into a shop in ski resorts and seen cuddly animal toys called marmottes? 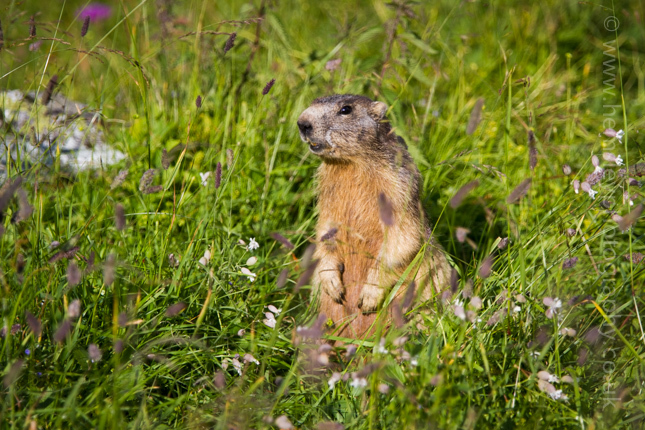 Come to think about it, how many pistes and lifts are there in the French Alps named 'Marmotte'? Quite a few I'd wager. 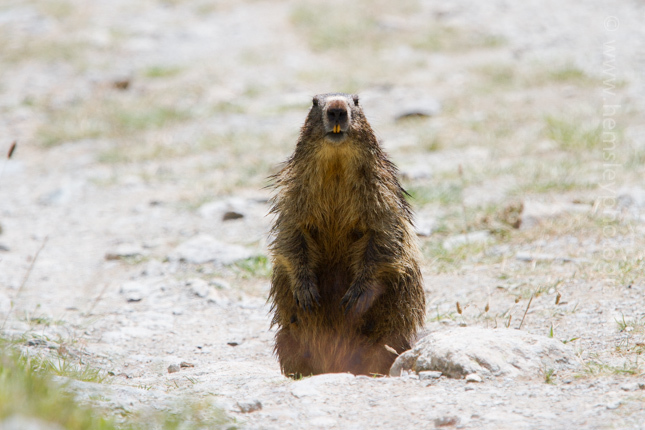 But the thing is, during the winter nobody sees them because they hibernate down in their burrows underground. A lucky few might catch a glimpse of one in April as the snow melts on the south facing slopes. 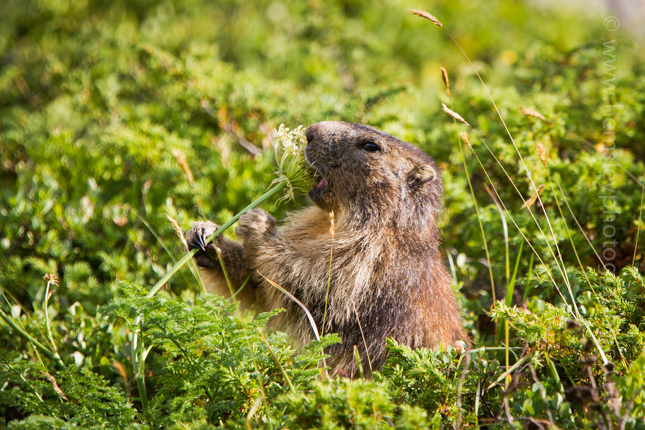 During late spring, summer and autumn they need to eat like crazy in order to survive the following winter. 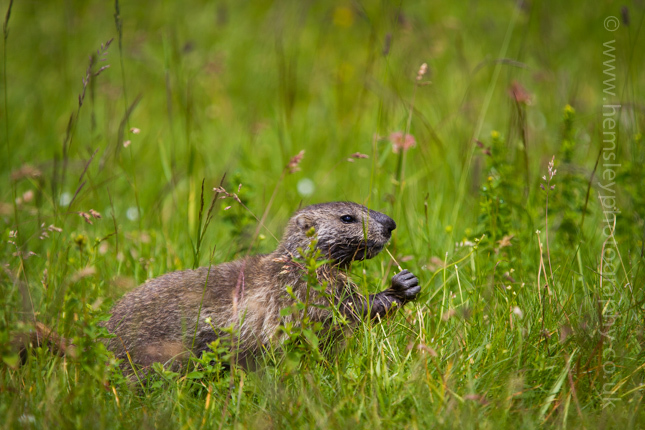 They really are adorable creatures, and you can't help but be transfixed by them if you can spot them. On the whole they like to keep considerable distance between themselves and humans, especially if they are being chased by empowered noisy tourists brandishing compact cameras, smart phones and even tablets (not kidding I saw that quite a few times). For years I've been trying to photograph them properly, and about dreamt of capturing 'the shot'. This holiday I tried and tried, fine tuned camera technique, adjusted field craft and just had great fun. In fact fitness improved considerably due to carrying a heavy camera bag around. I still don't feel as though I've nailed 'the shot' yet, so perhaps I'll have to go back again next summer and try again. Here are a few more images, including a little baby. 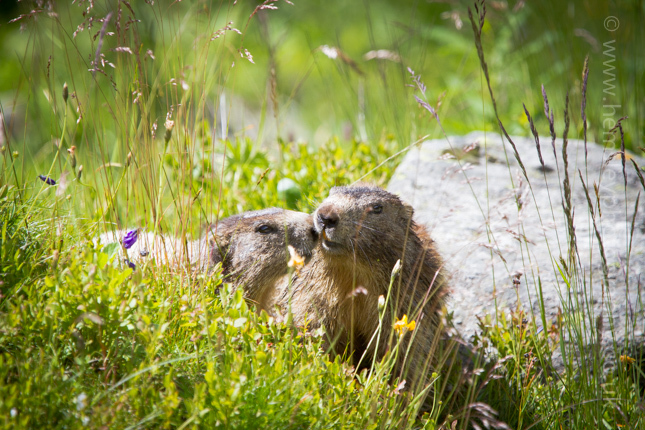 So do you think Méribel offers much for wildlife lovers in the summer? NOT HALF. However the list continues including golf, tennis, swimming, relaxation as well a whole host of events that the resort puts on. I kind of ran out of time to investigate these. Without sounding like I'm wishing next winter out of the way, I for one can't wait for next summer hoping to be able to visit Méribel again. 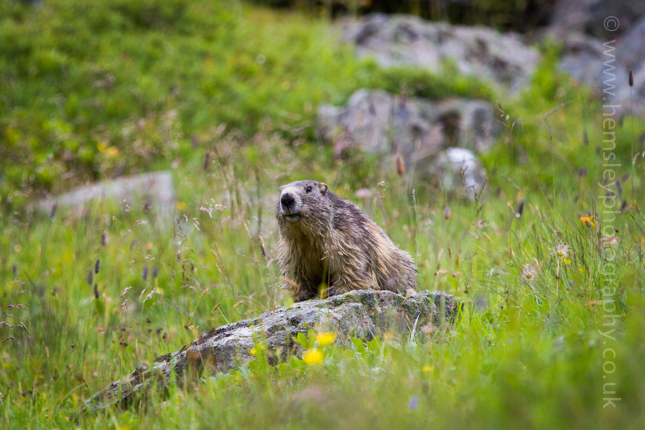 However, I must find a way of dealing with those city types who insist on chasing my marmotte friends with their blimmin tablets shouting noisily to each other! I'll return in a few weeks time when the summer holiday period is behind us and we'll think about skiing again. If you enjoyed this article but want to experience a skiing article, click here for a link back to last winter. Feel free to share away on Facebook, Twitter and Google+ by using the social media icons. Or leave a comment below, it would be great to hear from you. Martin.